In 2017, 90.9 million acres of corn, 89.5 million acres of soybeans, and 45.7 million acres of wheat were grown in the U.S.. Thanks to recent extreme weather patterns across the nation, a large portion of those crops carry a high risk of producing mycotoxins. Corn is especially susceptible to one toxin in particular: fumonisin. Fumonisin is a big problem when you’re trying to source the highest quality grains and raw materials that will be manufactured into livestock feed. Not only is it poisonous to animals, but it can also spread through grains and raw materials, ruining thousands of dollars’ worth of feed. Fumonisin and corn have a long history together. Fumonisin is perennially one of the most common mycotoxins that contaminate corn products around the world. This presents a challenge to producers and purchasing agents, especially in the cattle industry, because corn is one of their primary feed choices. Identifying contaminated products is essential to protecting the integrity of both livestock feed and animal health. There is only one way to determine if corn products and other materials have been contaminated: a chemical test of harvested grain. Dr. Tim Herrman from the Office of the Texas State Chemist (OTSC) spoke during a meeting between corn farmers in Amarillo, Texas last fall on the topic of the OTSC’s One Sample Strategy. The One Sample Strategy uses accurate testing and sampling to determine the risk of mycotoxins in a harvest. “We can test, and test accurately, using official procedures accepted and used by multiple places multiple times including crop insurance,” said Herrman. Fumonisin B1: This is the most prevalent fumonisin and is hepatotoxic and nephrotoxic in all livestock, causing serious damage to the liver and kidneys. Fumonisin B2: Not as common as B1, this fumonisin is cytotoxic, damaging living cells and inhibiting sphingosine acyltransferase, which negatively affects metabolism. While fumonisin is most commonly found in corn crops, testing in the U.S. has revealed that approximately 90% of all fields—not just corn—have some level of fumonisin contamination. Determining an acceptable and safe level of fumonisin in corn and other feed products is a vital step to ensuring the nutritional quality of livestock feed. According to the USDA’s Grain Fungal Diseases and Mycotoxin Reference document, fumonisin can spread through corn as kernels break or crack, providing more host materials for the fungi to grow on. It’s imperative to test grains and raw materials—especially corn—before allowing them to go through the feed manufacturing process. Once grains are ready to process or have already been processed, the best thing to do is use high-quality toxin binders that preserve the integrity of pelleted feed and create a safe product for livestock consumption. 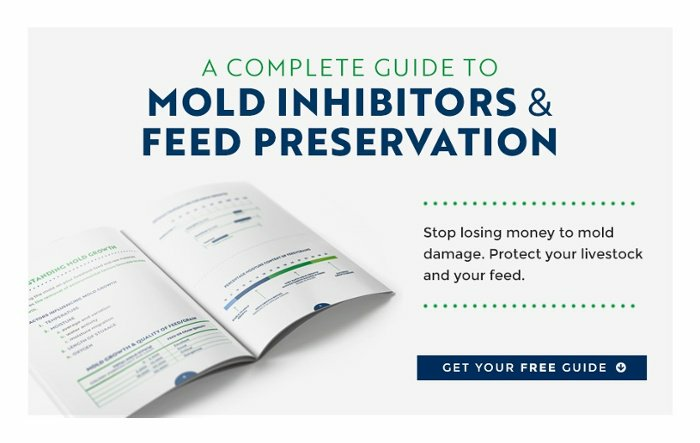 For more information on how to preserve your feed and enhance the nutritional quality ,check out our complete guide.